After wining the stage managed election of 2008 which was totally rigged in favor of Awami League under emergency, Sheikh Hasina again became the Prime Minister and formed the government. As the Prime Minister, her first priority was promoting two hand picked jounior Judges in the supreme court flouting the rule of seniority to form a 5 member bench including the Chief Justice. In that bench out of 5 members two were Hindus. The bench squashed off their review petitions and without allowing them the stipulated time as per law for filling the mercy petitions in a heist at mid-night on 28th January 2010, sent the five golden sons of the soil to be hanged at the gallows and brutally slaughtering Maj. Huda in presence of The Prime minister herself before hanging in Dhaka Central Jail one by one! This brutal murder was termed by the leading Media of the world as, ‘political trail of Hasina and miscarrage of justice’. 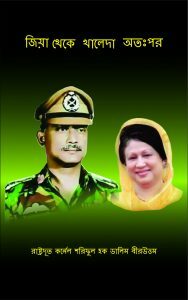 After this cold blooded murder, more 57 army officers were killed in a planed genocide organized within the BDR by Hasina’s government hiring mercenary Indian commandos. More than 200 protesting patrotic officers were thrown out from the after she was castigated in the Darbar at Shena Kunjo. The main reason was to eliminate from the spineal cord of any nation the armed forces the spirit of ’71, ethical values, nationalist pro people feeling and religious values so that the national armed forces can be used as the tool of prepression against the national interests to protect the interests of the vested rulling compredors and their forein masters. Now, let us see what was the reaction of the BNP and Jamaat the self proclaimed champions of the nationalism and religious values after the Judicial Murder of Hasina of five brave Golden Sons of the soil by hanging violating Laws of the land.